What should you do if your spouse isn’t frugal? What if your spouse is all about spending some dough, and you’re all about saving it? If you are one of those people who is really into frugality with a spouse who’s a spendthrift, then I feel you. Such was my problem when I got married. When I first met my husband, he had a fancy boat, a new car every 6 months, and the new tech toy/i-Whatever that just came out. He spent money, and he was good at it. So you can imagine my excitement when my husband looked at me the other night and said, “You know, I’m really starting to like this saving money thing.” That was enough to make me light up like the fourth of July. This has been a long time coming. My husband has always been what I call a “spendy” guy. He has always been great at making a lot of money, but even better at spending it all. Luckily, there’s a happy medium for us, and my husband is becoming more frugal by the day. 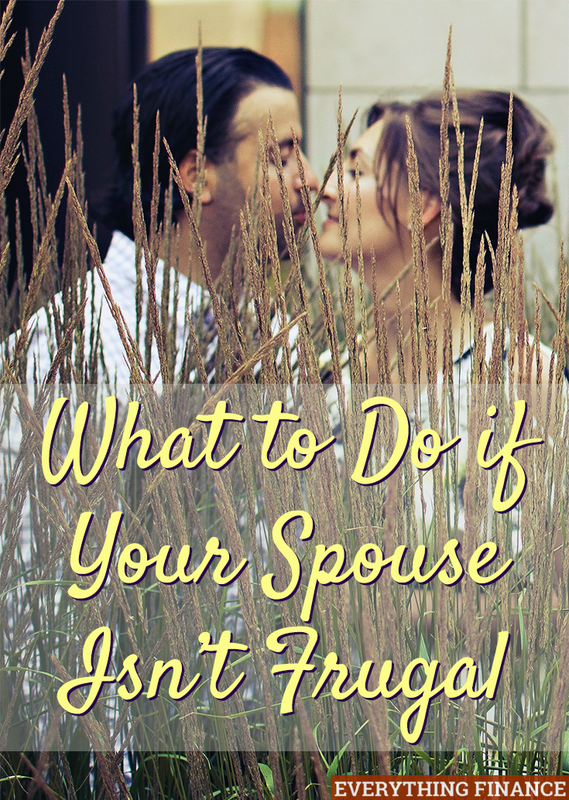 Take it from me: here’s what to do if your spouse isn’t frugal. I grew up in a family where I heard my parents discuss their budget all the time, and I can remember going without some things when my Dad’s employer went through a strike. Talking about money was never a big deal in our house. It was just normal. My husband’s family, on the other hand, was quite different. He remembers his mom being quite frugal, but also recalls that whenever his dad wanted something, he just went out and bought it without a second thought. Though we were both raised in middle class families, my husband and I came from completely different households where financial responsibility was taught differently, and I try to remember that. If your spouse comes from a completely different background than you, realize you can’t expect him or her to jump in headfirst to budgeting and saving money. It’s definitely not going to happen overnight, and you shouldn’t expect it to. A complete turn around of learned (or unlearned) financial practices can’t happen just like that. You need to be realistic. If you’re already frugal or simply want to become frugal to help out your finances, then take the reins of your financial household. Start balancing the checkbook, review credit card statements, and gather the information for your entire financial picture to help you figure out where to start. When I first started getting serious about our finances, I demanded my husband save his receipts so I could balance the checkbook myself. He didn’t ever care to balance it, and that drove me nuts! The only thing left to do was for me to take control of it, so I did. It’s easy to feel like giving it all up if your spouse isn’t interested in saving, but don’t! Take the reins now to control your spending, and eventually your spouse will come around. At the very least, one of you will be on top of your money. Be the best frugal example that you can be. If you find that your spouse always wants to go out to dinner and you’d rather save the money, start to make meal plans and don’t give them the chance to want to go out. Instead of a shopping trip, suggest going hiking at the local park or walking around downtown. The quality time together is worth way more than anything you could buy at the mall. When you think you’re ready, suggest no spend days. If you’re going to a festival where there’s plenty of interesting goods to be sold, or maybe going antiquing (two of my favorite hobbies), suggest that you leave your wallets at home and simply go people watch. Enjoy the atmosphere instead of spending money. Hopefully you both have goals you want to reach together, such as owning your own farm one day or retiring on the beach. If you haven’t planned them together, sit down and talk about it. Then write them down and post visual reminders of your goals around your house, such as near the computer or on the refrigerator. These visuals will remind you what you’re both working towards. If you’re considering a new purchase, you can think about your goals and evaluate if that new purchase actually helps you reach them. It used to be that for every birthday, anniversary, and semi-special occasion, my husband would buy me things. It was a nice gesture, and I understand he thought he was doing a good thing, but I finally admitted to myself and my husband that I didn’t want any more things. So I told my husband (nicely) to stop buying me stuff. I explained I wanted time together on our special occasions instead. From that moment on, we stopped buying so many gifts for each other. We still spend money, but we spend it where it’s important to us: on experiences and family time together. Our special occasions are much more meaningful now that we can recall certain events (like special train rides) around them rather than things. Even if it feels like you’ll never get there, keep at it. Being wise with your money will always be a good thing, even if everyone in your house isn’t super excited about it. If you can’t get your spouse on board with you, it doesn’t mean you should stop trying to improve your finances. Continue being a good example, and try not to talk down to your spouse when you’re discussing your finances. Now that my husband is continually becoming more frugal, he sometimes laments about all the money he spent so many years ago. I try to remind him that he can’t get down on himself for past financial mistakes because they’re what make us grow. Even now I have my challenges, but since I’ve seen what can happen when you have bad financial habits, I’m not going to stop working on managing our money well. Frugality is a journey, not a destination. There will always be new little tricks you can learn to save money now and in the future, so don’t lament if your spouse isn’t there yet. Set a good example, and they will follow. What about you? Have you and your significant other always been on the same page about your finances? What challenges have you faced?